Keep up with my latest travel destinations. Here I am sitting on the famous Japanese bullet train (Shinkansen). Just a few weeks ago, I was at home thinking about what exciting things waited for me in this country. Tuesday will conclude two weeks of travel in Japan. While some sights and customs turned out to be what I expected, there’s so much that did not — for better or for worse. I’ll be writing about two weeks worth of wonderfully Japanese things including fashion, traditional customs, and food, when I’m at home and can download photos from my camera. For two more days, I’ll be part of the hustle in Tokyo. Then back to the other East Coast! Meanwhile, you can see some updates from me on Instagram, @yevi_. I hope you’ll stay tuned for more! Let me know if there’s anything you’d like to see or read about! Update— I have extra printed postcards from this trip, let me know if you’d like one. When we booked the trip, I did what I always do: looked for sample itineraries. I visited Italy once before when I was studying abroad, so I knew that it would be difficult to see a lot in such a short amount of time. Every website said it: You can’t see Italy in a week. Since we arrived at home, I can confirm that it’s true. There’s so much to see (and eat) all over Italy, and many cities have smaller towns surrounding them with rich histories and lifestyles to experience. What was originally supposed to be a two-city trip (Milan and Florence), quickly turned into three. We actually booked our hotel for Venice while we were in Rome (thanks wifi & cheap travel sites). Though our traveling-policy is usually to not overdo it, we set a very quick pace. We did manage to came back to our room to work or relax for an hour or so, but some days it was tough to stop (or to start back up again). For anyone looking to take this trip: it’s possible, but you’ll savor every moment not on your feet. The Eternal City is one shrouded in myths and stories, much different from other famous cities. There are two legends about the founding of Rome, though both agree on the year — 753 B.C. The first says that after escaping Troy, Aeneas of Virgil’s epic poems (Aeneid) went to the area and married the daughter of a king. His children eventually became Romans. The other is the myth of Romulus and Remus. These twins were born from a virgin, sent to a Moses-like death and saved by a variety of gods, animals or shepherds, depending on the version. Ultimately, the city is founded by and named after Romulus, who kills his brother. Many cities advertise their rich histories, but it’s only Rome that has the past literally standing at its center. I was in awe the first time I saw the Colosseum in the distance. The Roman ruins stand out even though the city doesn’t have the modern steel and glass skyline of New York. I’ve never made it inside the Colosseum, but the entrance under its side is cold and dark. It’s really the only thing that reminded me that despite its impressive nature, this amphitheater saw thousands of deaths. Crowds watched both human and animal blood spilled here. It’s somber and strange when there are men dressed up in gladiator costumes for tourists. This huge national monument was constructed for Victor Emmanuel II, who became the first king of a unified Italy in 1861. A guy floats for tourists in Rome. I said it about Florence, and I’ll say it again: You don’t need to be Christian to appreciate the Vatican and St. Peter’s church. It’s just huge! I highly recommend seeing the museum and the church itself. The official Vatican tour was also worth it. It’s about three hours long, though I was told to see the entire museum would take much longer. We skipped many rooms including the contemporary art (Picasso, Matisse), to get to the Sistine Chapel at the end. You get a thorough explanation of Michelangelo’s famous fresco, “The Last Judgement.” Afterward, you can go back into the rest of the museum. Again, I’d highly recommend to get some sort of a guide. There were lots of fun facts and jokes along the way. The most surprising was that the latest restoration of the fresco (1980 – 94) was funded by the Japanese Nippon Television Network Corporation with $4.2 million USD. Basically, this Japanese company owns the photography and film rights of the Sistine Chapel fresco. That explains why I don’t have any photos, but I’m sure a Google search will help you out. I’m a big fan of museums and art (just in case you couldn’t tell), and this one was really amazing. A part of Rafael’s ‘School of Athens’, which featured Greek & Roman philosophers, mathematicians and Rafael’s Renaissance contemporaries. The Holy See’s Swiss guards. While in Venice we learned that Veneto, one of Italy’s richest states, had a referendum for independence from the rest of the country. The famous city of Venice is its largest municipality. About 4.8 million people live in the area. Almost 90% of eligible residents voted for independence. (Ultimately this vote was just for show). We arrived into Venice’s S. Lucia train station and had a nice view of a city on the water (and covered in bridges). Of course we still had about 2 miles to walk to our hotel, after deciding that the water taxi was too expensive. Well, here’s our walk on Google Maps, with an estimated 34 minute travel time. Once we got onto the first bridge, we realized that it would actually be pretty exhausting to walk all the way there. Not to mention trying to run back a couple of days later to catch our train. Take note of every where water crosses the islands (a bridge) and all of the hard turns. Our first stop after the hotel was Saint Marco’s Square, with a basilica, tower and palace at the center. This view onto the Grand Canal was really just beautiful. We also stopped at Alfredo’s Fresh Pasta To Go for a late lunch around 3 pm. It’s wise to have lunch before then if you want to sit down at a nice place. This applies to the other cities we visited as well. We got delicious, fresh-made pasta in Chinese takeout-style box. The owner was really sweet too, even after I spilled soda on the floor. Venice is one of those places people dream of seeing and rightly so. Still, I don’t think you need to spend more than a day and a half there to take it all in. After a full day, we were scrambling for things to do. I’m curious if someone had a different experience. Enjoy the sights of Venice. Check out the first part of this trip in Florence, Italy. That’s what stayed with me after a spontaneous trip to Italy. Since we work for ourselves, my husband and I take advantage of lulls in our schedule to travel. For our week long trip, we covered a lot of ground — Florence, Rome and Venice. Our first stop was Florence where art is not imported into museums, but is at the very heart of its history and its everyday life. This city is thought to be the birthplace of the Renaissance. Even now in hindsight, it is one of the most beautiful and interesting cities I have had the pleasure to visit. Our flight from NYC took us to Milan’s Malpensa airport, and then we took a high-speed train to Florence. (You can fly into any city in Italy, but we took advantage of a discount from Emirates Airlines. Look out for a two-person deals around Valentine’s Day. This happened in 2014, and in 2015 they also offered a round trip flights for two people for $799! Their “economy” section could just as well be first class in my opinion). This is the city where the Renaissance began in the 14th century. Everything that was inspired by the Italian lifestyle or Roman paganism and funded by the influential Medici family (14-15 c.) or the church so many centuries ago still defines the feel of the city. We tried to visit some of the important sights in Florence in two days. Italy is known for having lots of plazas that are closed off to cars for the most part. If you walk along the Arno River there is no shortage of them. There are also several old bridges connecting the city on both sides of the river, the most famous being Ponte Vecchio. This bridge is only open to pedestrians and has a hidden tunnel underneath that was built for the Medici family to cross over. Supposedly the bridge was spared destruction during World War II because Hitler walked over and thought it was beautiful. Piazza della Signoria is another impressive area, where Palazzo Vecchio sticks out with its tower and Roman statues seem to be everywhere. The Uffizi Gallery has a large collection of Renaissance art, including Michaelangelo’s famous statue of David. One of my favorites was the sculpture of Neptune, the Roman god of the sea (or the Greek’s Poseidon). Inside the palazzo, the grandness of Salone Dei Cinquecento truly took us by surprise. The giant frescos on the walls, the golden panels on the ceiling and the statues are not something you can forget. My photos definitely don’t do it justice, but if you plan to visit it’s definitely worth the 10 euro ticket. Besides the main hall, there are several floors of rooms filled with art. When the Medici family lived there, the rooms were painted to represent each member with a Roman god. It’s a pretty great concept and a spectacular thing to see. Located in Piazza de la Siggnora, next to the famous Uffizi Gallery. We also spent a few hours admiring the Florence Cathedral, known officially as Basilica di Santa Maria del Fiore in Italian. It’s easier and common to refer to it as “il Duomo” (the dome). There’s an entrance fee that includes the dome, bell tower and the cathedral. A note to future visitors: to get up to the top of the dome, you have to climb 436 steps so wear your sneakers and bring a bottle of water. It wasn’t easy but the view was amazing. The dome is painted with Renaissance frescoes. Though much of the art here is religious-themed, you don’t have to be part of the church to enjoy it. I don’t know why, but I was really into the part of the fresco which I now know is “The Last Judgement” (1572-79, Giorgio Vasari). Not knowing much about Biblical stories, I was thinking about Dante’s The Divine Comedy the whole time. In fact, Dante was born in Florence though he was exiled for part of his adult life. Part of the appeal of the dome, constructed by Filippo Brunelleschi, is that its complicated construction is somewhat mysterious. From its completion in 1446 to today, it is still the largest “brick and mortar” dome ever built. An article in National Geographic from February 2014 said that architects are just figuring out how such a large construction site came together more than 500 years ago. To this day, we don’t know where he got the inspiration for the double-shell dome, the herringbone brickwork, and the other features that architects through ensuing centuries could only marvel at. Perhaps the most haunting mystery is the simplest of all: How did Brunelleschi and his masons position each brick, stone beam, and other structural element with such precision inside the vastly complex cathedral—a task that modern architects with their laser levels, GPS positioning devices, and CAD software would still find challenging today? – Tom Mueller, Nat’l Geographic. Clockwise: The ceiling of the dome, the outside, climbing up, one of the hell-fire frescoes. After our hike up il duomo, we put off climbing up the famous bell tower. We finally decided to go at sunset, but only got part of the way. I’m sure it’s worth it but I don’t have any regrets. My feet agree. Another major stop is Pitti Palace, and the adjoining the Boboli Gardens. You have to buy a ticket to some of exhibits to get into the gardens. We saw several rooms in the palace and one exhibit of fashion from influential women of the past and present. After everything else we saw, the gardens were a bit disappointing. Everything looked unkept. Maybe it’s because it was technically still winter, or maybe not. The gardens were large and it was hard to tell which paths led to something more than more trees. We relaxed a bit on the benches, but I’m not sure how much of it we actually saw. That’s my husband posing at the beginning of the gardens. He’s more handsome in person. We were exhausted at the end of our first day, and even more so at the end of the second. On the third day, we jumped on another train to Rome. Looking back I’d probably take at least another day in Florence. It turned out to be my favorite. Want more of Italy? Read about the second part of this trip to Rome and Venice. At Caesar’s Palace in Atlantic City, N.J. Whenever it starts getting cold and the holiday season approaches, I start thinking about what has been going on in my life. The New Year is on my mind. One of the big changes in my life for 2013 was that I started working with my husband. This means a lot of time in the same apartment, staring at different screens. We have been kind of busy so this weekend we decided to take a one-night trip to Atlantic City. Let’s call it a road trip because what should have been a two-hour drive actually took four. That was all right. One of us is driving and the other is DJing. It’s a trip to spend some time together after all. We wanted to get away for a day or two, before anyone really noticed we were gone. We go without our families, we put our obligations on hold. Despite the ridiculous, mid-day traffic in New Jersey, we have a good time getting to our destination. He lets me choose the music. We talk about politics, the economy, the future. I talk about that guy from Duck Dynasty who was in the news. We entertain ourselves and say sweet things instead of yelling at people slowing down on the highway. We stay at Harrah’s for the night. Our goal was to check in and go swimming. We relax in a hot tub with a bunch of strangers instead because… vacation. We check out of work mode for those hours — it’s all about us. But vacation is not life. That doesn’t mean life is not good when we get home. It doesn’t mean we didn’t have good moments before getting in the car. A few days ago, a friend and I discussed how people are able to choose a partner* and then live with them for the rest of their lives. There’s the cliche five-year itch and the marital bickering from knowing too much or getting too comfortable. She asked me how couples deal with seeing the worst of each other over time. What do I think, you ask? Yes, it’s wise to continuously do things for each other. It’s good to give, even when you don’t feel like it. But what really help are the “vacation” moments. Not the physical act of leaving your home. Instead, it’s free and only takes as long as you want. That is, you have to remember that the good moments happened at all. It’s easier to remember the negatives. It’s easier to joke to your friends about the cliches because like any stereotype, the truth is there. I’ve been seeing these “memory jars” posted online, which really makes the idea literal. Basically, you put a note in a jar whenever something good happens, big or small, and then you read all of the notes at the end of the year. I think it’s a great idea to bring to a relationship or just to do for yourself. I might give it a try, and remember being on vacation all year ’round. Do you call your parents? Caïn by Henri Vidal thinking about the TSA. Fun fact about me: Going on vacation stresses me out. From the process of packing to getting to the airport and getting to the destination is usually a headache. And packing a suitcase, don’t get me started. 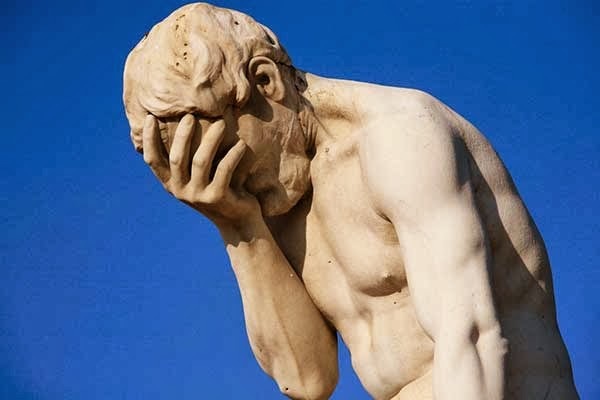 I always lie awake the night before trying to think of something I’ve forgotten. – Planning, because does anyone actually pack more than a day ahead? – Picking out too many pieces of clothing. (There are obviously people to impress in vacationland). – Strategically placing items like perfumes and make-up so they’re safe. (Baggage guys, I don’t trust you). – Where do the shoes go? – Folding all of the clothes. We know it’s coming out wrinkled on the other side. – Reminding myself not to forget a toothbrush and toothpaste. (Bless you hotels that have free ones). – Forgetting something despite reminding myself. I’ll remember when we’re on the highway. – Closing all of the caps! Ziploc bags are my friends here. – Getting to the check-in area past the maze of confused and wandering people. – When TSA asks for my name and where I’m going. (If you’re wondering, this blog has a great list of things NOT to say to a TSA agent). – Becoming nervous for no reason at all. – Thinking about all of the scary second-hand information I’ve received when walking through the body scanner, because: logic. What’s awesome about it all? Remembering your’e going on vacation. Mojitos and sunshine, we will unite soon! 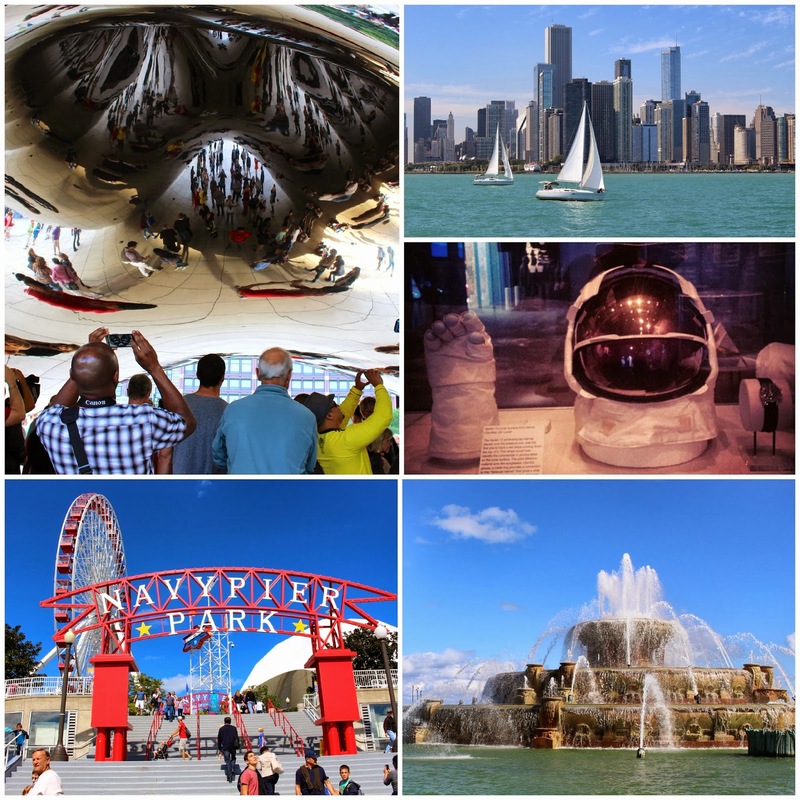 Chicago is a fun city to visit when the weather’s nice and you’re ready for an adventure. 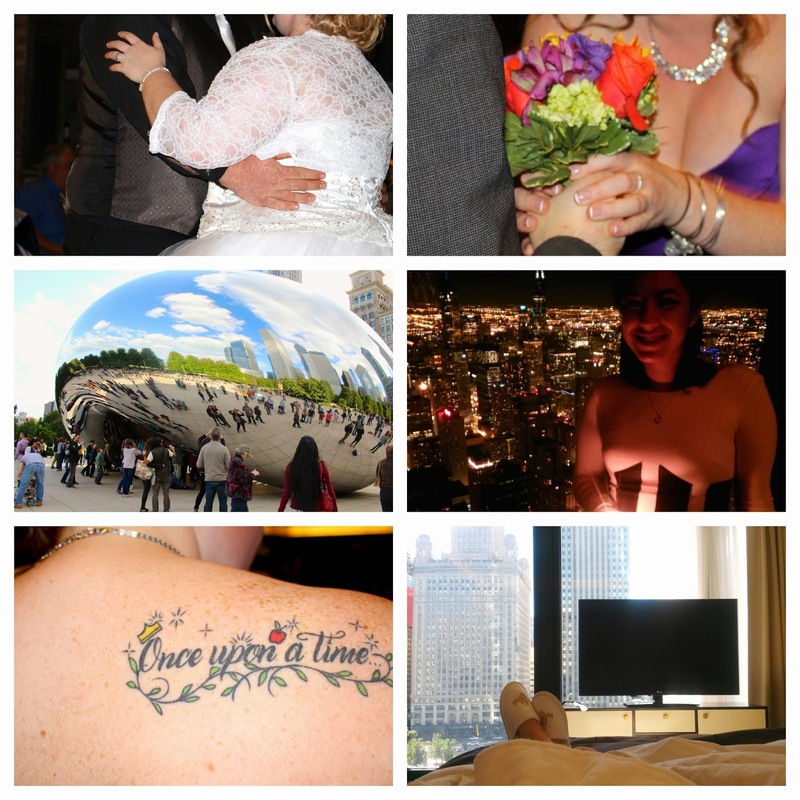 I attended a beautiful wedding in Bloomingdale, Ill. (late September 2013), and then took the train into downtown Chicago. Our first hotel, which was actually a resort, claimed to have “Frank Lloyd Wright-inspired” architecture. It wasn’t until we got to the city that I realized how important this was. What is Chicago’s deal? (or, a tourist’s experience over a few short days). Yes, there’s the famous deep dish pizza. I had to try it after an exhausting, bike-friendly ride around the city’s streets. (I’m partial to New York’s style but my hubby enjoyed it). Check out Pizzeria Ora. It was quiet and the waiters are friendly. Yes, there’s “the bean,” but that’s just, literally, the gate to one of the most beautiful parks I’ve yet seen. (I had to Google the real name: Cloud Gate). It’s located in Millennium Park, a relatively new section of Grant Park. My suggestion, grab a bike and explore all the touristy areas and the streets in between. If you’re worried about wandering around, ask a waiter for some tips on the neighborhoods to avoid. The inside of the park and the buildings lining the city’s namesake river are a marvel. So what’s the deal? There’s this mix of architecture that mimics everything from Greek temples, to the Jazz Age’s art deco, to building’s straight out of sci-fi movies, a.k.a. “modern” design. We took a river tour on our last day (so worth it), but by then I had become acquainted with these glass and metal and brick structures for several days. Each building is unique. Some reflect the water and sky, and others stand wide across the skyline but each style seems to come together. 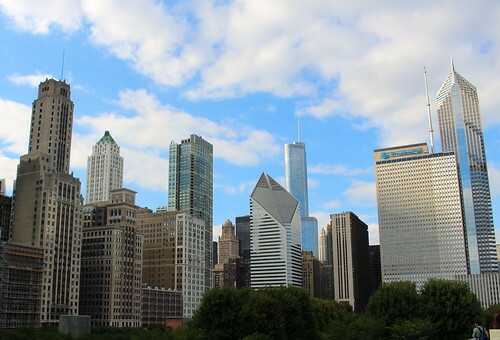 Check out my Flickr set for the skyline & sights of Chicago. The tour guide (on Wendella boats) confirmed my thoughts — Chicago’s architects were inspired by several schools and styles. Chicago’s skyline definitely left a lasting impression with its combination of all of my favorite artistic styles (classic Greco-Roman columns, black glass and steel, gold covered art deco rooftops). Definitely worth a visit! I’m sitting in a dorm room and I just saw a boy chuck a coffee cup off his balcony, right into traffic. This traffic which moves on the opposite (left) side of the road. The cars appear as if they have no drivers to the untrained (American) eye! So, I’m in London. It’s all been exciting and scary since my parents dropped me off at JFK. I’m helping myself by pretending that I know where I am at all times with the help of William Blake and Google Maps! (As if tons of poetry will replace any 21st century experiences). I’ll be here for about four months, one school semester. About 2983 miles (5580 Km) from home. This really isn’t helping. I’m more excited than homesick. My brain is pretty eager to note all of the things that aren’t New York City. I have been sitting here all day and pretending that it’s still summer. From my window, the weather is beautiful and there is a nice breeze. Jack Johnson strumming and singing in the background really gets my brain going. I’m just daydreaming. This past summer was my first trip to Spain, or even Europe. (First – hoping that it is the start of a long list of trips). The ten days I spent there were amazing. To describe it with simply a word is unjust. It was such a new experience for me. The culture was different, the geography was new and the people were beautiful. The lifestyle was much slower and easier to take in. If the opportunity to live there ever arises, I would certainly take it. I have so many dreams, hopes, goals that I start to make these ridiculous lists sometimes. I try to live my life in a way that they are kept in check and so that I can stay motivated. It sounds so ambitious, but these “dreams” make everyday tasks seem very tedious. I figure that if I don’t do half the things I wanted to do in my life, at least I would have been going in the right direction. I have already been so lucky but that should never stop anyone.